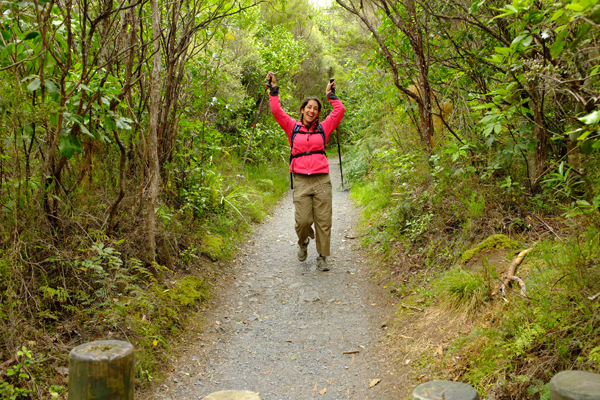 The number one day hike in New Zealand is the Tongariro Crossing. 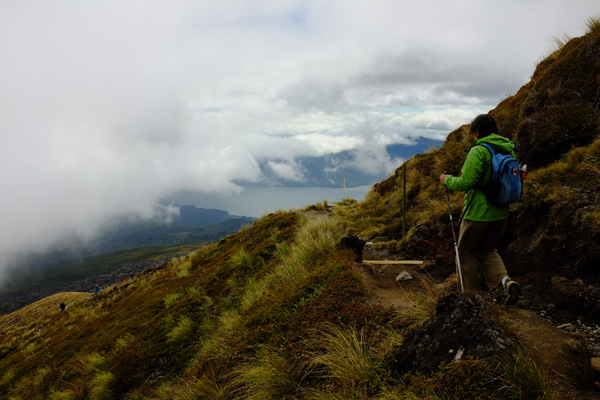 It is a 19km hike that goes up Mount Tongoriro (An active Volcano), across a plateau, and down the other side again with an elevation change of 1km. 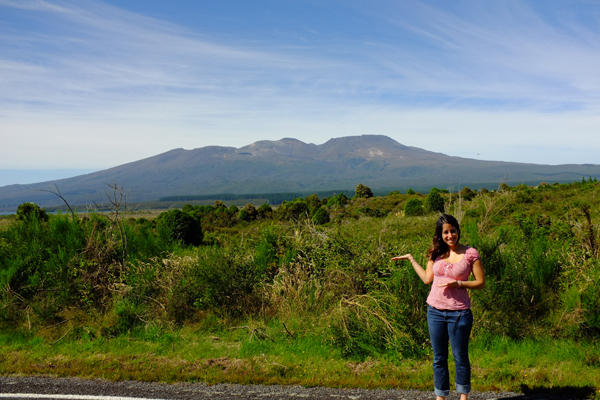 This area is where they filmed a number of locations for The Lord of The Rings films including Mordor and Mount Doom. You can instantly see why they chose this rocky barren landscape. This hike would be my biggest challenge yet. We arrived at the trail head at 7:20am and, it was so foggy that you couldn’t actually see any of the mountain and was quite cold. The weather was not on our side. 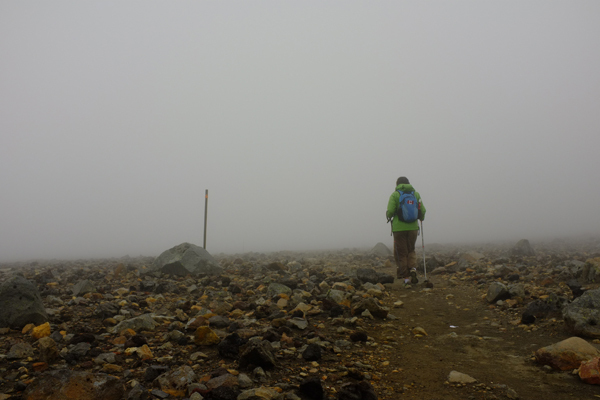 The first bit of the hike wasn’t too bad; in fact the fog added an eerie feeling to the air which was almost pleasant. It wasn’t until we began our accent that it began to get tricky. The higher we got, the windier it got, and near the top there were 50km/hr winds on us. At times I felt like I was going to blow over the side of the mountain, but we kept trudging on. On a good day you are supposed to see vast magnificent views of the surrounding landscape, but all we saw was white. When we eventually made it over the top ridge, we were finally provided with some shelter from the wind, and even got a blurry view of the emerald pools. As we began our decent, the fog began to disappear and when we reached below the cloud level, we could at last see the landscape below. It was beautiful. I can’t imagine what it would have been like at the top on a clear day. The last 5km were the hardest. My knees were starting to hurt, I developed some wicked blister on my feet and my pace slowed down significantly. I kept expecting to see the parking lot around the next corner, but there were more and more trees. 7 hours later when I finally came to the end I was so happy I almost felt like crying. The Tongoriro crossing was the most physically challenging thing that I have ever done, and I was so happy that I finished. The real kicker was the next day, as we were driving by the mountain, the skies were crystal clear blue, and the sun was shining. Sigh, such is life. Well done! Or as Frodo would say, “Oh Sam”. I wish I had a Sam to carry me up! I thought I was going to die doing this crossing. I could barely walk the next day! I did absolutley nothing the next day, my body was not happy with me. Aw love your story! Beautiful pics! Thanks Kathleen! Photo credit all goes to Tyron here. 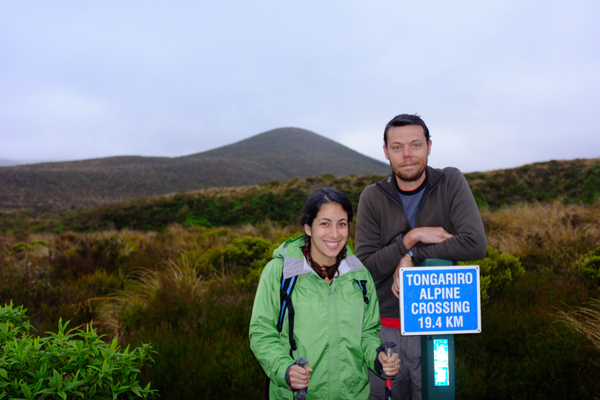 I am so enjoying following your blog, have been doing some research about the Tongoriro crossing to learn more about your experiences, pity about the weather on your day of crossing but well done for hanging in there! Yes, the weather was a big bummer but I am still glad we did it!